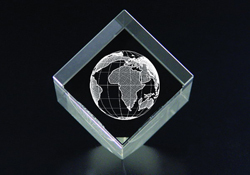 2" x 2" x 2" crystal stands on angled edge. 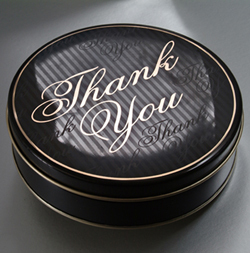 Gift card can read: "Working with you means the world to us", or "A World of Thanks" or "Wishing You A World of Success." Be creative. Optional revolving mirrored base with LED lights at additional cost. 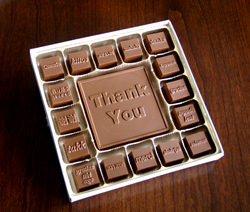 Send these special confections with messages of: “Thank you for your referrals.” “Thank you for your business.” “Thank you for understanding.” “Thank you for the invitation.” Available in either dark or milk chocolate and gift boxed. Kosher. Fill with your choice of soft sea salt or rum caramels OR fruit cream center truffles No minimum order. 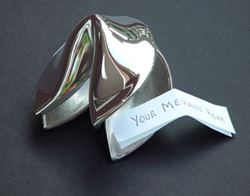 Write your own "good fortune" message to tuck inside this hinged nickel-plated silver cookie. 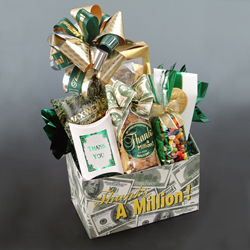 "It's our good fortune to work with you", or "Wishing you good fortune in your new job" are a few suggestions.